Perrin Manual Boost Controller UNIVERSAL - Dezod Motorsports Inc - Home of the automotive performance enthusiast since 2002. Adjust your boost pressure with a few simple twists of the PERRIN Manual Boost Controller to obtain your desired boost pressure and achieve your ideal power output. 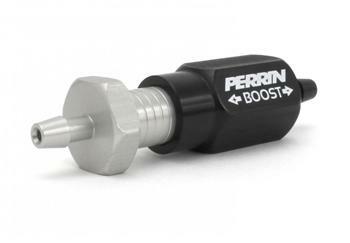 The PERRIN manual boost controller is a simple inline device that allows the customer to adjust boost simply by shortening or lengthening the Boost controller body. The “twist-to-adjust” body incorporates a custom wound internal progressive rate spring and ceramic metering ball for boost management. Applicable to all turbo charged applications. The Ball and Spring portion of our Boost controller holds boost pressure (until your set point) from getting to the wastegate actuator. This makes for a super responsive turbo. As the pressure exceeds the set point, the ball lifts and lets pressure to the wastegate actuator. By adding a Bleed Hole we are able to help control the falling boost curve, by compensating for the added volume of air as RPM’s increase. This is a major advantage to the PERRIN design over the competition. While they may look similar, the actual boost control fails to meet our level of performance and prevention of boost spikes! The PERRIN Boost controller has both functions built in.